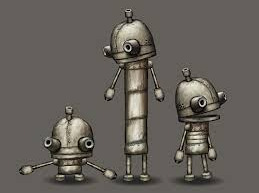 Machinarium was originally released for the PC in 2009 by Amanita Design. They’ve got a history with puzzle games, having already created the first two games in the Samorost series by the time this game was released. The game was met with almost universal acclaim upon release, being described as ‘one of the most beautiful and endearing games of the year’ by IGN, and ‘beautiful, haunting, charming and funny […] one of the best adventure games ever made’ by Destructoid. Since winning all this praise in 2009, the game has been released on pretty much every available platform going. The game features nothing in the way of dialogue. Any sense of the of the protagonist’s character and personality is through occasional memories of happier times for the little robot, presented via thought bubble. That’s not to say that it’s not effective, and he comes across as a cheerful, resourceful kind of chap. Even more effective is the sense of characterisation from his idle animations. You’ll get a chance to see this fairly regularly, as any time spent too long trying to figure out a puzzle without moving (which is bound to happen fairly regularly), means he’ll eventually burst into dance or scratch at an itch. Can robots get itchy? Perhaps it’s rust. The location of the game is set out really well, which gives the game a real sense of place. The environments are all hand drawn, and the care and attention shows. The setting feels like a large sprawling city in which you’re following one small robot’s adventure amongst many others happening in the same place, rather than going from screen to screen seeing a series of locations built as specific backdrops to house puzzles for the game. Most of the game’s locations are beautifully drawn, if somewhat heavy on the grey and brown. Don’t get this game in any form that involves touchscreen. The control system when you’re playing via touchscreen makes the game difficult to control. The robot can only interact with objects that are within his immediate vicinity, which means that you have to send him back and forth across the screen a lot. It’s easy to send him to the wrong place and, once he’s set off, there’s no way to cancel his movement and you have to wait until he’s done walking. One of the robot’s special talents is that he can change his height, either compressing or extending himself, to help reach items he otherwise wouldn’t be able to. He can still move in this state, but at a greatly reduced speed. What this means is that if you accidentally send him to the wrong place while he’s taller, you may as well put the game down and go make yourself a coffee in the time it takes him to precariously totter his way across the screen. Only one of these forms will move at a speed that is even mildly tolerable. Mostly the controls are just annoying, but there are some puzzles where there’s a time element involved, and then it can become excruciating. There are a couple of sequences fairly on in the game, where you’re expected to change heights, press a button to begin the countdown, and then get the robot to a certain place before the time limit expires. You’ll end up repeating these sequences over and over, perfectly aware of what you need to do, but feeling like the controls are actively conspiring against you. That sense that the game is conspiring against you will only increase when you come up against the most fiendish puzzle in the game: a simple game of noughts and crosses. A link to help with this puzzle can be found here if you’re playing on PC. If you’re playing an app version then… god help you. There are actually several mini-games throughout Machinarium and none of them are particularly fun, with noughts and crosses being the worst of the bunch. Some of the games have been seen hundreds of times before, in which case they just need to be endured. For example, to even be allowed access to the in-game hint guide, you have to play through Machinarium’s version of Helicopter. If the games are original, then they’re needlessly complicated. Either way, they take you away from your enjoyment of the main game. on a entirely different subject but it has pretty much the same page layout and design.